In times of forest fires, the availability of a ready water supply can be unreliable due to demand or environmental conditions, especially in rural or remote areas. Having a secondary source of water, such as a water bladder tank (also known as a pillow tank) on hand for emergencies can make the difference in protecting your property. So much so that in fire-prone areas, insurance policies (whether for home or business) will often offer reduced rates for those who maintain a water storage tank for fire protection. 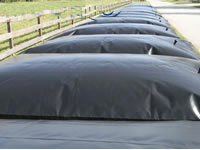 Water Storage Bladders, for sale by GEI Works, are collapsible tanks that can be used for emergency water storage. When full, they resemble a pillow in shape, thus they're also referred to as "pillow tanks." Water bladder tanks are available in potable (with FDA approved fabric coatings for drinkable water storage), and non-potable fabrics. Considered portable tanks for firefighting use, water bladder tanks can be easily collapsed, folded, and moved for reuse. Unless secured in a transport crate, transportation of full water bladder tanks is not recommended (for safety reasons). Insurance requirements of water storage generally follow NFPA guidelines for the size of the fire protection water storage tank that's needed. A common standard suggests that the size of the tank support a flow of 250 gallons per minute for approximately 20 to 40 minutes. (Buildings smaller than 1,500 square feet in size usually require a 20 minute flow time, while larger buildings require longer.) Check with your local fire department for the exact recommendations in your area. These pillow tanks can also be equipped and used for sprinkler system water supply. Due to the massive weight of the water tanks when full, NFPA recommendations often require a concrete base beneath the tank. If you're considering locating the tank in a different holding situation, please check NFPA guidelines to ensure safe usage of your fire protection water storage tank. Questions about portable water tanks for firefighting? Give GEI Works a call at 1-772-646-0597 to discuss your project's requirements! *Smaller water bladder tank sizes are also available upon request. Emergency water storage tanks are also available in other styles. Popular smaller-scale portable tanks for firefighting are the self-rising Onion Tank and the Frame Tank. For large-volume permanent tanks, consider a corrugated steel tank or fiberglass tank for long-term fire protection water storage use. All of our tanks are equipped with fittings making them easy to use with portable firefighting equipment. Self-Rising Onion Tanks: Similar to pillow tanks, onion tanks are portable tanks for firefighting use. They provide collapsible water storage, but with a self-rising quick-fill option. Onion tanks are available in 500 to 10,000 gallon sizes. Frame Tanks: A favorite portable tank among firefighters and first-responders. Frame tanks are collapsible tanks that fold flat for easy transportation. They feature an open top for quick filling (and emptying). They can be quickly set up (in minutes). Frame tanks are available in 500 to 5,000 gallon sizes. Permanent Water Storage Tanks: For permanently mounted fire protection water storage tanks, in virtually any size, consider corrugated steel tanks, welded steel tanks, or fiberglass tanks. Each has special features that make it suited for specific uses and environments. Need a water bladder tank? Give GEI Works a call at 1-772-646-0597 to find out more about our water storage solutions!